I know it's tempting to skip the genealogy in chapter 1 and skim the story of Jesus' birth in chapter 2 but these familiar stories often don't get the attention they deserve. You may think God can't speak through what you already know so well. I hardly ever read genealogy chapters, but I'm so glad I did because there nestled in verse 5 is the dear man I love so much, Boaz. I nearly missed him, would have skipped straight over him but I stop and smile and think of the importance of his appearance in this long list of names. Boaz is a man who is hard working, honourable, caring, respectful and respected. Alongside him his wife Ruth, such a love story that brings them together but that's for another time (or read it Ruth 2-4). She's a foreigner, unwelcome, afforded no respect and low on the scale of acceptable. Do you feel like a stranger in your surroundings, somehow not quite fitting in? Does a past or present life of sin shadow your heart? Do people only see the outside and not the gentle, broken, beating heart within? God breaks through the shadows of sin, rejection and hurt that surround us like a barrier, he reveals the gentle heart, he welcomes the lowly and saves the sinner. Not just for a moment and not just for your benefit. Neither Ruth or Rahab could know that their names would be forever penned in the family tree of David, they didn't know they were ancestors of the coming saviour. God does not only heal our hurting hearts, he teaches them to sing, he does not make us whole and leave us, he fills us with joy so that we will sing his praises and lift up his name. You don't know the part you are playing in God's final plan, you don't know where your name will appear. As heirs with Christ you are already a part of the genealogy in chapter 1, these are the ancestors that God gave us to learn from and you are the witness to teach generations to come. These are the men and women God uses to fulfil a plan, to birth a saviour and they were not perfect and they were not sinless. What about the others, have you read their stories? Some we know little about, they are not famous or well known. Many of them do not have the greatest of character, and yet here they are recorded in the line of David. Would you be living differently if you knew you'd be in this line up? Would you live as an heir? You are already in line to the throne; you don't need to be perfect and have life sorted to live a life worthy of the royal blood you have been saved by. 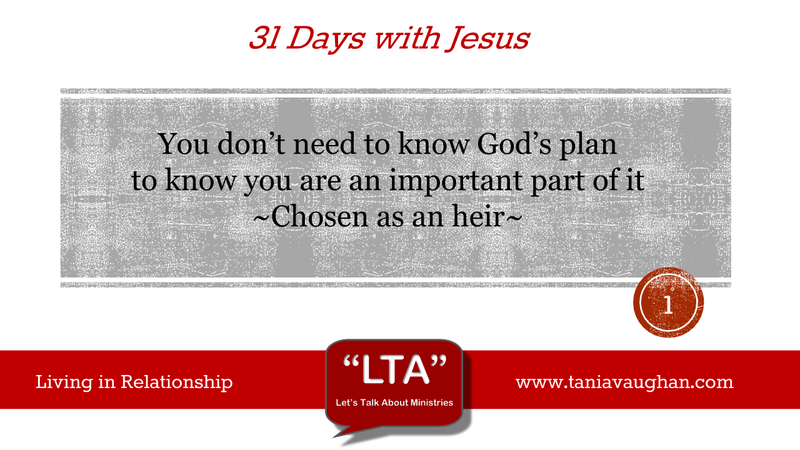 Lord, I thank you that you have chosen me to be a part of your plan and have made me an heir with Jesus Christ. I want to live the life that you died to give me in all it's fullness, producing good fruit for your namesake and for your glory. As I commit to this study I ask that you would give me an open heart and enable me to hear your words as you speak into my life. Lord, I want to be in relationship with you in a way that reflects your goodness and mercy to those around me. Powerful. So much caught my attention and made me think and re-think. What a gift. This stood out most for me: "God breaks through the shadows of sin, rejection and hurt that surround us like a barrier, he reveals the gentle heart, he welcomes the lowly and saves the sinner. Not just for a moment and not just for your benefit." There is so very much in those sentences. So much that wins over my soul. But then you add the reminder - it's not just for my benefit. And that's were I so often get caught up. What's in it for me. But it's not about me. It's about Him and His glory. And He is loving, and kind, and compassionate, and the lover of my soul - because that's Him. But still - my focus needs to be Him and not me. Thank you for the powerful truths you have reminded me of and given me to think about. Thank you Kelli so glad God spoke to you about his glory through today's study. I do hope you continue with us on this journey. I love mining these genealogies. I am always struck by the idea that the ancestry of David and the Christ involved "outsiders". These were not Jews, but people who were enemies. Isn't that just like us. So reassuring that all are welcome into the family of God. So blessed that you stopped by my place for FMF. It is such an encouragement Amy when we realise the people that God welcome. I'm glad you enjoyed today's study, please do sign up and join us on the rest of the journey this month. Thank you for your thoughtful first post of 31 days with Jesus.